No. 34, Jalan Meranti Jaya 7, Taman Meranti Jaya, 47100 Puchong, Selangor, Malaysia. Welcome to CK Mac Sdn Bhd – we are the leading specialist in CNC Machinery and the go-to company for manufacturing solutions. We supply some of the best range of CNC machines that are affordable, reliable and with excellent quality throughout Malaysia. Our CNC machines have been applied across a broad range of market sectors and helped many clients automate their production with a string of other benefits. Whether you own a small scale factory or a large one, we have the right machines for you. 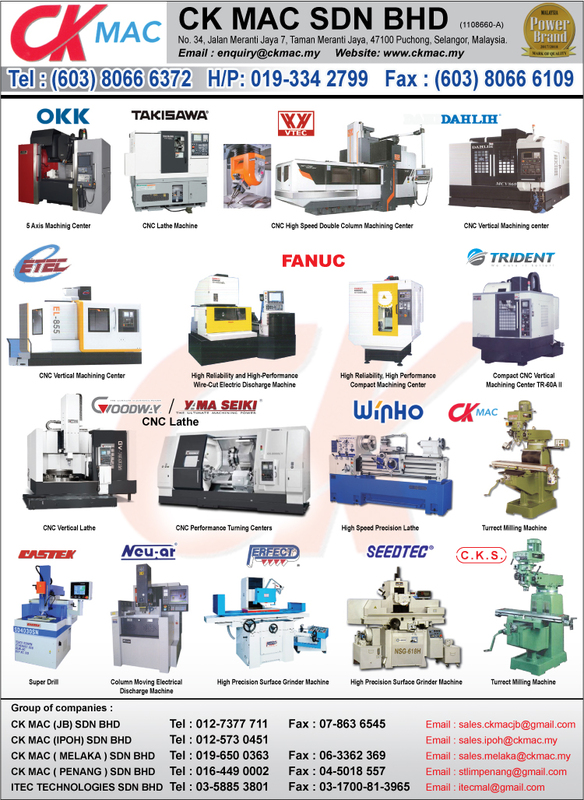 Our top-of-the-line products include CNC Lathe Machines, CNC Milling Machines, CNC Double Column Machines, CNC 5-Axis Milling Machines and Tool Room Machines. CK Mac Sdn Bhd provides the best CNC machining solutions that will help your operations increase efficiency. These days, every company seeks to increase its productivity. Our CNC machines are made for mass production and they produce your designed parts with the same result every time. Unlike manual machining, with CNC machines you get increased automation and can reduce the number of operators required significantly. There’s also less chances of error since these machines are operated by computerized programs which are highly accurate yet flexible. Ultimately, profitability is increased due to savings from raw material wastage, less manpower needed and increased productivity as these machines can run continuously 24 hours a day. With CK Mac Sdn Bhd, you get total peace of mind. We are a service-oriented company and the owner himself has intense technical knowledge with more than 20 years of experience. There are many CNC machines in the market with numerous brands and specifications. We save our clients the hassle by providing them with valuable information needed for them to select the right CNC machines for their business. Before delivering the machines, we test each one to ensure they will operate according to the high standards that we set. We also prioritize on installation and training for our clients. We provide extensive on-site training for owners and their staffs so they know the machines’ functionalities well and they are capable of operating the machines proficiently. CK Mac Sdn Bhd is committed to providing excellent service and support. We have a strong team of professional service engineers that will assist you for any service & maintenance matters. These service engineers are highly trained, experienced and have access to extensive range of spare parts in our warehouse. They will be assigned to extend prompt support when there’s a breakdown to ensure that your downtime is kept to minimum. In addition, we have implemented a CRM system with real-time information and records to help us serve our clients better. We offer an extensive range of CNC machines that are affordable and reliable. We provide prompt, excellent service that are second to none. Contact us today and we’ll work meticulously to fulfill your needs. We have branches located in Ipoh, Penang, Johor and Melaka.